Oh it feels like such an age since I sat down to write a proper post! The major project I've been working on in Sydney was finished at 4am last Monday and then lodged at lunchtime. As soon as was seemly, I excused myself from the client thank-you lunch and got my backside on a plane to Melbourne to my very own sweet bed for the first time in over two weeks. It's taken me some time to catch up on sleep and even longer to get my head on straight, but I think I'm nearly back to normal. I've been at class this week and slightly panic-struck at the work I need to get through, but I think it's just residual panic from the tender, rather than necessary panic, as things really are in hand. Some things I've been meaning to share with you, for a few months now, are my adventures in embroidery. At the beginning of the year when I still didn't know whether I'd gotten into the textiles course and Mexico was an utter fantasy, I decided I needed a back-up plan. Some textile thing to keep me going if the others fell through. 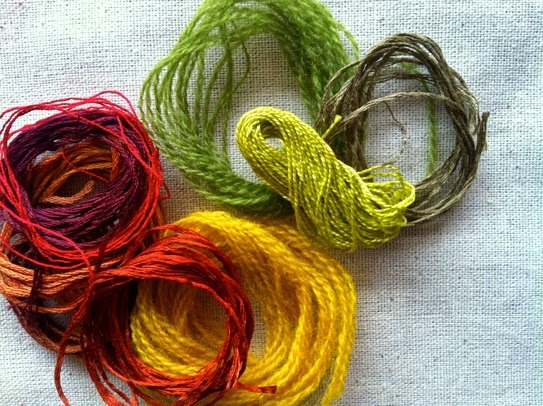 And so I signed up to a three-year correspondence course with NSW Embroiderer's Guild. About five minutes after paying my fees, getting my place at RMIT, being accepted into the residency in Mexico and landing a massive tender project at work it was more like "what the HELL were you thinking?!?!" Anyway, it was done, and I forged ahead. 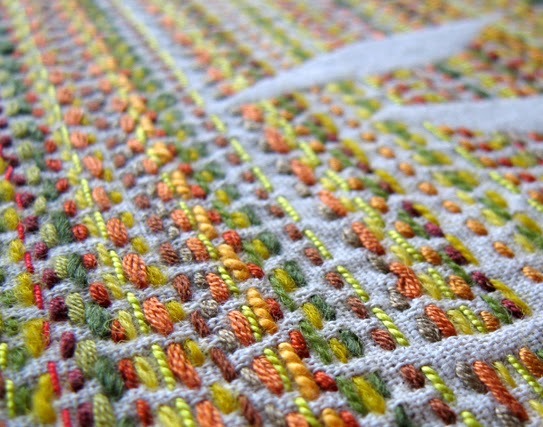 I'm into Module 3 now and really enjoying it despite a few hiccups and random late night stitching sessions. So, I thought I'd take you back to module 1 and show you a bit of the process. Obviously I won't be sharing the whole course on here, but this module is fairly common knowledge (it's given out as an example when you enquire about the course). First, there's what arrives in the mail – basically a pile of threads. Along with the threads come instructions for the stitch you're to use – in this case it was running stitch (it is Module 1 after all), and your theme which, for Module 1, was leaves. 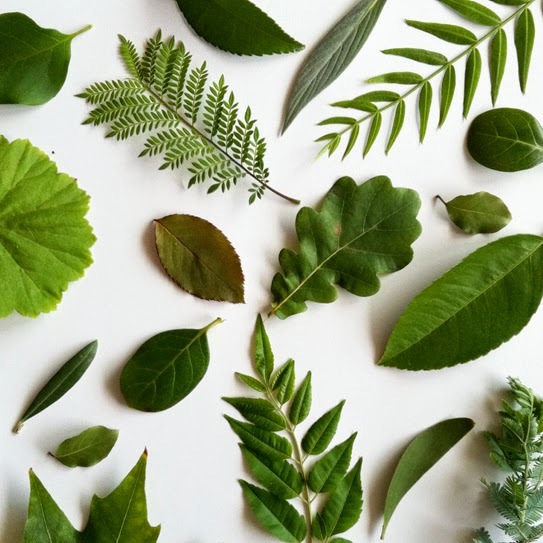 At the time our assignments in class were all based around botanicals (loosely), so I went on a leaf-collecting mission on my way to the coffee shop. Who would have thought that an 800m round trip could yield such a collection. This is just a small sample below. From here I was a bit at odds... I was really attracted to doing something with the eucalyptus leaf shape, but it didn't suit the Autumn colours since gum trees are evergreen. I did quite a few little sketches at this point, playing around with shapes and how the stitches might work. In the end I settled on negative space, that way I could use the gum leaf shape and have the threads more reminiscent of tree bark. 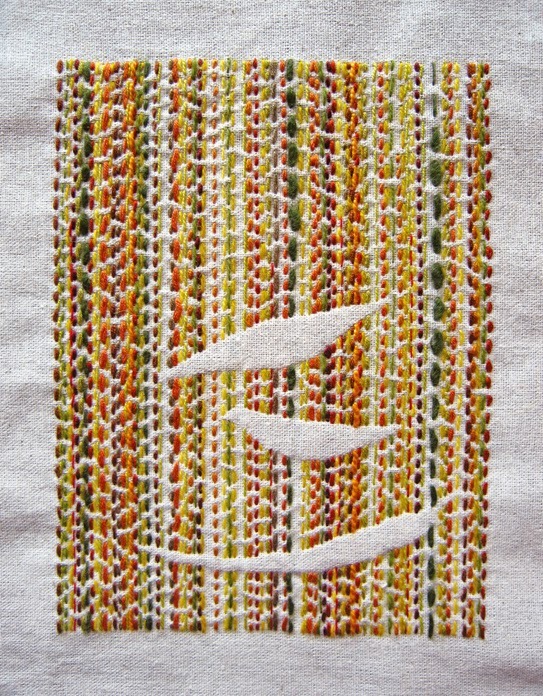 It was a bit of a marathon to get it finished in time – I had no idea how long it would take me to stitch the space! I've been a bit more organised since, now that I know how long each one takes. We get a month to do each module, but the thing that takes the longest for me is living with the threads and colour palette for a bit and coming up with a design, not necessarily the stitching. So, here's the finished piece from Module 1. I've also kept a Pinterest board for inspiration if you're interested. I think we need to talk knitting next week – I've got a real pile of projects stacking up. Hope everyone has a great week! Wow - Tara! Congrats on all the exciting upcoming projects / activities ahead - whilst it sounds exceptionally busy it does also sound exceptionally exciting! Great stitching :) Can't wait to read more. What a lovely piece Tara! Am so tempted to try it out. Thanks for sharing.